I am SUPER excited about today’s post. First off, I get to brag about one of my very lovely food blogging friends. Second, I get to share an AMAZING recipe with you. Third, I get to do a giveaway. So much goodness in one place! Aimée Wimbush-Bourque is a friend I met through blogging that I am beyond grateful to know. She is lovely and talented and I am lucky to have her as one of my people. Her blog Simple Bites is wonderful and she is truly an inspiration to me. The woman pretty much makes everything from scratch. When you grow up on a homestead AND you’re a professional chef you tend to do that sort of thing. I know I will never be an “Aimée” myself, but one can always dream…and at least I try! 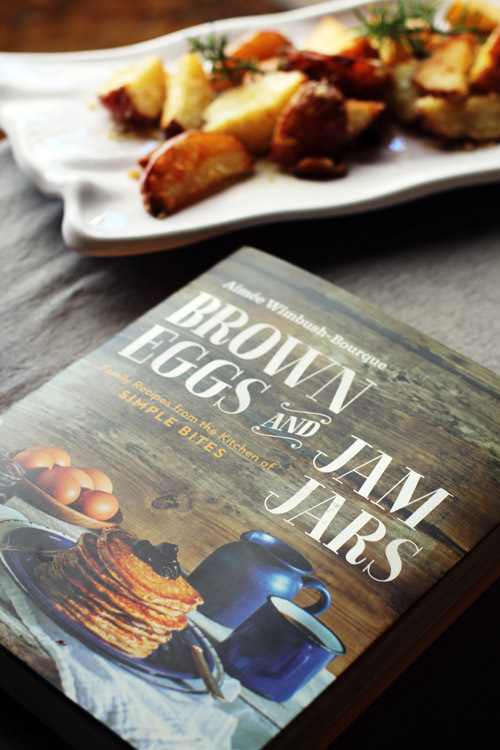 Aimée just published Brown Eggs and Jam Jars and I am so happy to share this beautiful cookbook with you today! (Congratulations, Aimée!) My friend Allison came over this morning and we made a couple of Aimée’s recipes from the book. It was such a lovely morning, spending time with a friend making recipes written by another friend. I’m feeling all aglow with cheesy friend-i-ness! 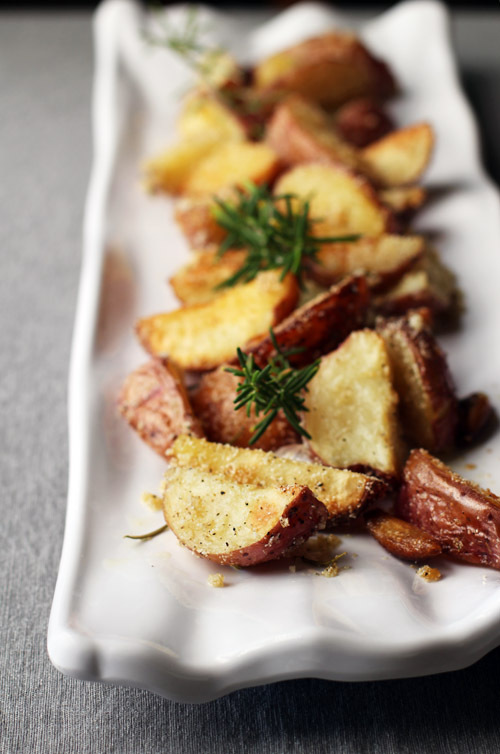 Today I get to share Aimée’s recipe for Crispy Rosemary Roast Potatoes with you. Holy HANNAH, people. So good. Allison and I basically ate the entire batch. (We won’t talk about how many potatoes that was!) The technique for cooking the potatoes coupled with a cornmeal coating made for truly perfect roast potatoes. Perfect and dangerous. I wasn’t kidding when I said Allison and I ate an ENTIRE BATCH. At 10:30 in the morning, mind you. SO GOOD. Anyway, Aimée’s book is filled with similarly wonderful recipes and I highly recommend you buy the book immediately! Right after you enter today’s giveaway, of course! We are giving away a copy of Aimée’s beautiful book to one lucky, randomly-selected winner! Simply leave a comment telling us your favorite thing to make from scratch and you’re entered! Aimée is all about going homemade, so I think chatting about our favorite from-scratch recipes is the perfect way to celebrate her book launch! So, to recap, to enter the giveaway please leave a comment telling us your favorite thing to cook/make/bake from scratch by Midnight PT on Wednesday 3/11/15. Prize needs to be shipped to a U.S. or Canadian address. 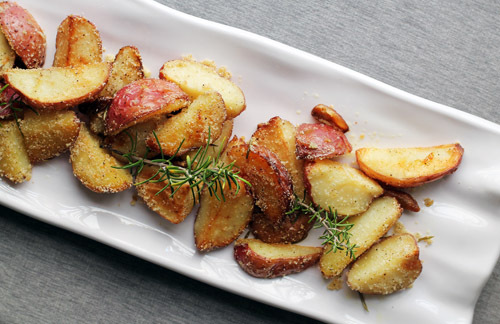 And with that I give you Aimée’s recipe for some of the best potatoes you’ll ever eat. Enjoy! 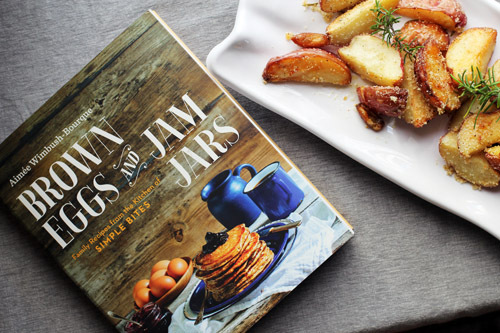 This recipe is from the book "Brown Eggs and Jam Jars" by Aimée Wimbush-Bourque and makes some of the best roast potatoes this side of anywhere! Position a rack on the lowest level of the oven and preheat oven to 425ºF (220ºC). In a large bowl, mix together cornmeal, remaining 1 teaspoon salt and pepper. Drain potatoes, then transfer to the bowl with cornmeal and toss gently to coat. 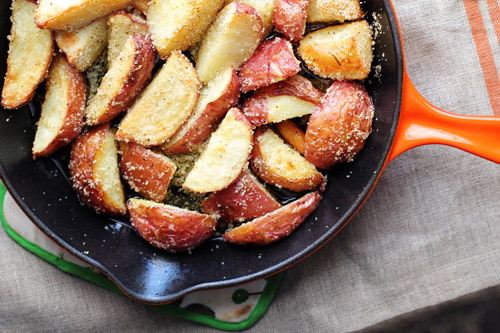 Carefully add the cornmeal-crusted potatoes all at once to the hot oil and arrange them with your tongs so that they are evenly distributed around the pan. Place the skillet in the oven and roast for 15 minutes. Carefully remove pan from oven and turn each potato so the crispy side faces up. Roast for another 20-25 minutes or until golden all over. Using a slotted spoon, transfer potatoes to a serving platter. Sprinkle with chopped fresh rosemary and a sprinkling of sea slat if desired. Serve at once. Frittatas. I love our farm fresh eggs. And they are so versatile! I’m so thrilled for Aimee! Though I don’t know her personally, I love her blog and can’t wait to get my hands on her new book! I bake just about everything from scratch but apple pie is and always will be my favorite! We love making everything from scratch at home, but my kids always request fluffy, homemade pancakes. Mandarin Orange Muffins and Caramel Popcorn (not together though!) are what I’m craving tonight but I make just about every thing from scratch so my favorite really just depends on my mood! My favorite thing to make from scratch is chicken and dumplings! I love making the dumplings!! Cookies! Always a welcome treat around my house, no matter what type. I love when I make turkey chili. I usually wing the quantities a bit. Chipotle peppers in adobo are a must. I think one of my favorite dinners is sausage and mushroom pasta. I have been so excited for this cookbook! I’ve had it in my Amazon cart since it came out, but haven’t come up with the right excuse to get it yet, so I’d love to win. It’s hard to pick a favorite thing to make from scratch, but muffins and pancakes are high on my list. My favorite thing to make is pasta dishes (and desserts)! Favorite thing to make from scratch- definitely salad dressings with good olive oil and flavored vinegars. So much better than bottled! Thanks! I love making homemade soups. There’s something really comforting about cooking and stirring a big pot a soup. Beautiful photographs, Jane. I just may make those potatoes this evening. I have all the ingredients except the fresh rosemary. But I won’t make it without the fresh herb. I have so much fun making a fresh strawberry shortcake roll. Everybody loves it. it is mouth-watering when you view it and simple to make. OMG! Share, share, share! The potatoes look great. First time to your site here, and I am so glad! Favorite… making something out of something else?? lol. Like brownie mix into almond joys, or cookies from cake mix, or meatballs from Dr Pepper.. Most things from scratch! Creamed, fried potatoes – the best!!!! 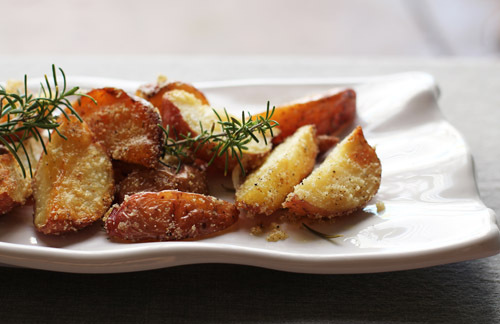 Oh – and those potatoes look fab – can’t wait to try them…. My favorite thing to make from scratch is a good Midwestern meal of meatloaf, broccoli casserole and mashed potatoes! YUM! Those potatoes look fantastic, I can’t wait to try the recipe! Old fashioned Macaroni and Cheese with Ham – absolutely my favorite comfort food. i love to make salad dressings from scratch because they are fast, easy, and taste better than store bought dressings. these potatoes look delicious! I cook as much as I can from scratch, but probably one of the most fun things (that I only get around to occasionally) is pasta from scratch. The kids love to help me. hi, i love making my mom’s cinnamon rolls, thanks for the chance to win this beautiful book ! I make just about everything from scratch, but I think my favorite thing is pudding, any kind, from scratch. So delicious, and easy too :). This cookbook looks great! I make lots of things from scratch — this morning it was vegetarian split pea soup in the pressure cooker! I love to make crockpot soups of all varieties! Yum! I love to bake bread and cookies (chocolate chip!) from scratch. Everything is better from scratch, right? Vegetable lasagna – a true labor of love and worth it! Love love LOVE to make roasted chicken wings for my husband. Thank you for the chance to win and for the recipe. I love your blog!! Quiche!! My new favorite thing to make! I make your Aunt Kathy’s black beans all the time (the recipe from the sweet potato and black bean burritos) I made them earlier this week. I love to bake cookies. Those look amazing! And, one of my favorites is a Vegetable Tofu Thai Curry Soup that we love. i love to make my all time favorite childhood meal, beef cube steaks with mushroom gravy and mashed potatoes! 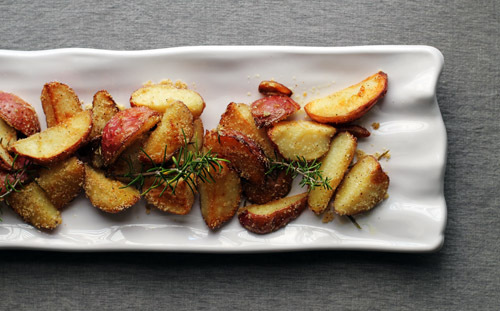 I love potatoes and rosemary together. I will have to try this recipe. Cookies are my favourite thing to make from scratch. I love making buttermilk biscuits from scratch. There’s something wonderfully therapeutic about using your hands to combine cold butter and flour. Not to mention they are delicious! I love to bake sourdough bread! I love to make my mother-in-laws spaghetti sauce. It’s so easy, yummy and quick. Haven’t bought spaghetti sauce in years! Looks delicious- recipe AND book! Cookies always better than store bought! Mashed potatoes 🙂 These potatoes look AMAZINGLY delicious. 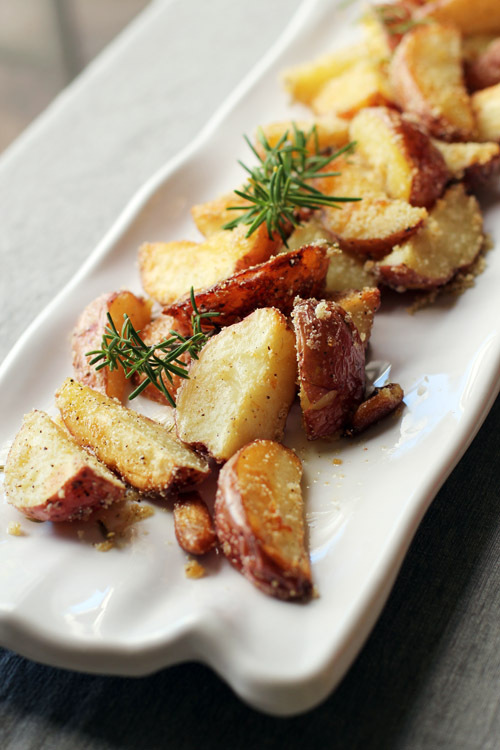 i am so making these…sooo yummy…i love rosemary!!! i am going to try them with sweet potatoes too.. I often cook yogurt from scratch, and my kids love it. But my favorite thing to make is biscuits from the cookbook, Homesick Texan. After kneading the dough you fold it in half and whack it a few times with the rolling pan, fold again, and repeat for a couple of minutes. It’s very theraputic! 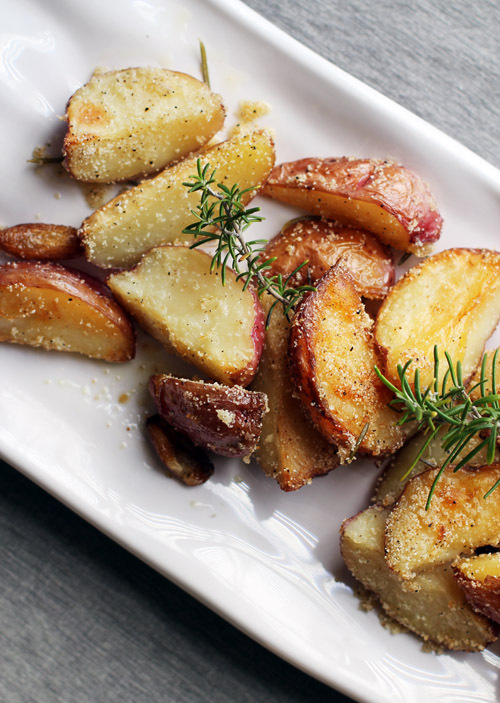 Love this method for potatoes! This looks gorgeous. Brown eggs! I love making bread,makes me feel like a hero. I love making soups. Just don’t do it often enough. I love making soups but just don’t do it often enough. I love making quick breads because they’re quick and perfect to eat any time of day. My favorite thing to bake is a cake. My favorite thing to make from scratch is any dessert! I love making toffee and homemade caramels. chicken & dumplings! My gma’s recipe! Like a warm hug! I love making rolls from scratch. These potatoes looks great. My fave thing from scratch? I like to make the olive oil crust for my quiche. Today I made paella and for the first time ever I made seafood broth from leftover shrimp shells rather than using bottled clam juice. It was totally worth it.